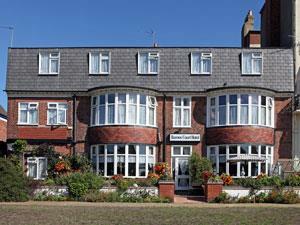 Barons Court01493 843987work Guest AccommodationThe Barons Court in Great Yarmouth is situated just off the golden mile, This family run guest accomodation has been recently refurbished to a high standard. The establishment consists of 14 en suite bedrooms some of which have a view of the sea, but all equipped with a colour TV, tea and coffee making facilities and towels, hairdryers are available on request. Bed and breakfast is as standard although a wide range of home cooked meals will be available each evening, vegetarians and children are both catered for. Afternoon teas are also available which can be enjoyed on the patio in the private gardens. We have a licensed bar, a guest lounge and car parking facilities. The Barons Court in Great Yarmouth is situated just off the golden mile, This family run guest accomodation has been recently refurbished to a high standard. Great Yarmouth's historic town centre is just a 5 minute walk away, the beach is almost on your doorstep and the main bustle of the golden mile is a mere 2 minute walk. The region is easily accessible by road from all parts of the UK. Major trunk roads into Norfolk are the M11, A11, A11, A12 and the A14 from London and the South-east, while the A47 and A14 serve the Midlands and the North. On approaching Great Yarmouth proceed to seafront, turn 1st left into Albermaira Road, Barons Court is 5th on the left opposite Great Yarmouth playing fields. By Rail: There is a regular local service from Norwich to Great Yarmouth, with connecting trains from Norwich to London, Liverpool Street. Peterborough, Cambridge and Ely.